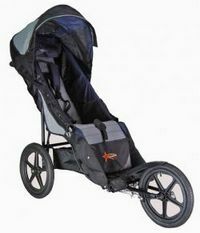 Axiom Size 3: All-terrain folding mobility system with an adjustable sun canopy. Accommodates a child approximately 12 to 15 years old, 59″-64″ in height; foot plate with foot straps; adjustable H-harness; maximum weight capacity of 200 lbs. To find this item, or similar items, search for equipment in MATP-LTL.